Andrew Bell and Mary Ward report. Josh Crawford has been elected president of the Sydney University Liberal Club in a victory for a splinter “left” group, endorsed by NSW Young Liberal president Alex Dore. Josh Crawford, who is the son of state Liberal politician Catherine Cusack MLC, beat out 2016 failed USU Board candidate Dom Bondar, with a vote count of 170 to 114. He led a group of people from the party’s left. 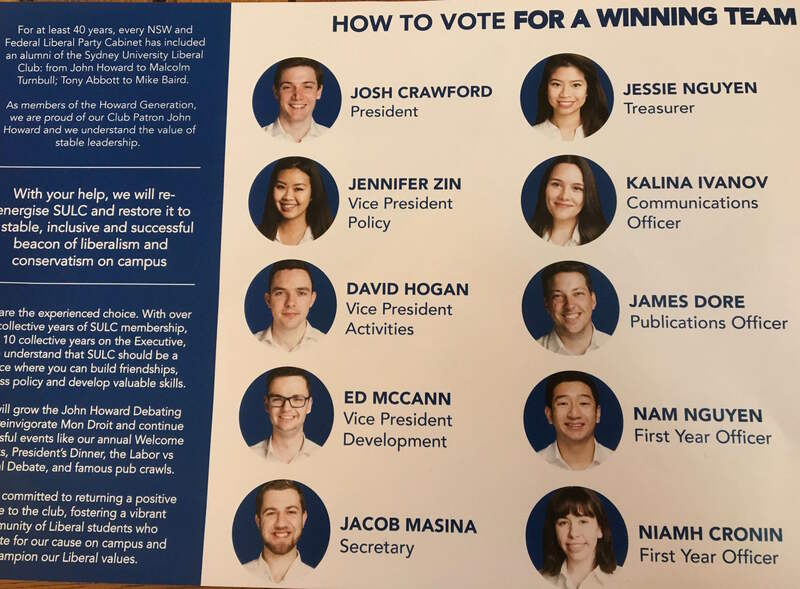 Accompanying him on the ticket were Shimmy on Board campaign manager Jacob Masina (Secretary), Jessie Nguyen (Treasurer), 2015 failed USU Board candidate Jennifer Zin (Vice President Policy), SRC councillor David Hogan (Vice President Activities) and SASS president Ed McCann (Vice President Development). The group successfully defeated an establishment ticket from the party’s centre-right. Led by Bondar, this group was backed by outgoing president, Will Dawes, and included current treasurer Dimitry Palmer and Mon Droit editor Catherine Priestley. The meeting was held in the Footbridge Theatre and was attended by close to 300 people. The vote count for remaining positions is yet to be finalised, although it is highly likely that attendees voted according to each how to vote. SULC has traditionally been a base for the centre-right of the Liberal Party. The club has strong connections to federal politics, with prominent members regularly seeking pre-selection in federal and state seats and working as federal and state staffers. The SULC AGM was postponed to today after the USU dissolved the club’s membership in May, in response to then president Will Dawes and then secretary Josh Crawford being unable to agree on a method of measuring members eligible to vote for the executive election. The factional dispute manifested in accusations of stacking, allegations of hijacking of the SULC Facebook page, omitting members from mailing lists, inability to schedule general meetings and all-round high degrees of animosity. The USU required the entire membership to sign up again at ODay, under the watch of security and USU personnel. Bondar’s team were handing out how-to-vote pamphlets at the ODay stall. A number of non-student ACCESS card holders attended the stall to enrol, overwhelmingly with the intention to vote for Crawford, prompting allegations that he was attempting to stack the election. At tonight’s meeting, many students voted and left after hearing Crawford’s speech for presidency. In another set of screenshots, a member of Crawford’s ticket is shown to be messaging various friends asking if they know anyone who has an ACCESS card, unfussed whether they identify with the Liberal movement or not, and even trying to solicit votes from Labor Club members.